Fits.me's Fitbot Lets Online Shoppers See How Different Sizes Will Fit Them | OhGizmo! Given how difficult it can be to find clothing that fits my lanky frame in brick and mortar stores, I don’t even consider shopping for clothes online an option. But a new service called Fits.me has actually come up with a pretty clever way to let people of all shapes and sizes see how a garment will look on them while shopping online. The secret is an animated mannequin with a body composed of separate panels that can be individually adjusted via servo motors on the inside. This allows the mannequin to grow or shrink to any body shape or size. But the Fitbot, which exists as both male and female versions, isn’t designed to be used in clothing stores, or controlled remotely via a website. 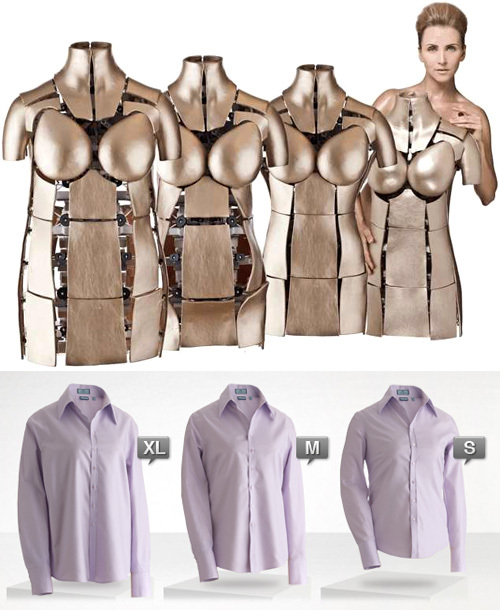 Online retailers can actually use it to produce an extensive series of photos of a given garment, showing how it would fit on an exhaustive series of body types. You can try out the service on the Fits.me website using the ‘Try it on’ button on the main page. You’ll need to take the time to measure your body so you can feed it your specific dimensions, but once you’ve done that you’ll be able to see just how well, or poorly, a garment would fit you.